Armagh (/ɑːrˈmɑː/ ar-MAH; from Template:Etymology/lang Ard Mhacha, meaning 'Macha's height' [aɾˠd̪ˠ ˈwaxə]) is the county town of County Armagh in Northern Ireland, as well as a civil parish. It is the ecclesiastical capital of Ireland – the seat of the Archbishops of Armagh, the Primates of All Ireland for both the Roman Catholic Church and the Church of Ireland. In ancient times, nearby Navan Fort (Eamhain Mhacha) was a pagan ceremonial site and one of the great royal capitals of Gaelic Ireland. 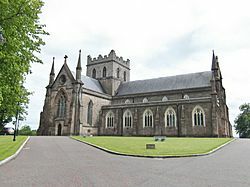 Today, Armagh is home to two cathedrals (both named after Saint Patrick) and the Armagh Observatory, and is known for its Georgian architecture. Although classed as a medium-sized town, Armagh was given city status in 1994 and Lord Mayoralty status in 2012, both by Queen Elizabeth II. It had a population of 14,749 people in the 2011 Census, making it the least-populated city in Northern Ireland and the fourth smallest in the United Kingdom. Eamhain Mhacha (or Navan Fort), at the western edge of Armagh, is believed to have been an ancient pagan ritual or ceremonial site. According to Irish mythology it was one of the great royal sites of Gaelic Ireland and the capital of Ulster. It appears to have been largely abandoned after the 1st century. 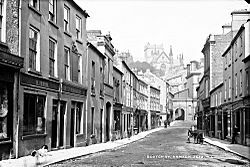 In the 3rd century, a ditch and bank was dug around the top of Cathedral Hill, the heart of what is now Armagh. Its circular shape matches the modern street layout. Evidence suggests that it was a pagan sanctuary and the successor to Navan. Like Navan, it too was named after the goddess Macha – Ard Mhacha means "Macha's height". This name was later anglicised as Ardmagh, which eventually became Armagh. Ard Mhacha was founded by Saint Patrick, it having been granted to him by Daire, son of Finnchadh, son of Eoghan, son of Niallan. Twelve men were appointed by him for building the town. He ordered them, in the first place, to erect an archbishop's city there, and a church for monks, for nuns, and for the other orders in general, for he perceived that it would be the head and chief of the churches of Ireland in general. In 839 and 869, the monastery in Armagh was raided by Vikings. As with similar raids, their goal was to acquire valuables such as silver, which could often be found in churches and monasteries. The Book of Armagh came from the monastery. It is a 9th-century Irish manuscript now held by Trinity College Library in Dublin (ms 52). It contains some of the oldest surviving specimens of Old Irish. Brian Boru is believed to be buried in the graveyard of the St. Patrick's Church of Ireland cathedral. After having conquered the island during the 990s, he became High King of Ireland in 1002, until his death in 1014. In 1189, John de Courcy, a Norman knight who had invaded Ulster in 1177, plundered Armagh. Armagh has been an educational centre since the time of Saint Patrick, and thus it has been referred to as "the city of saints and scholars". The educational tradition continued with the foundation of the Royal School in 1608, St Patrick's College in 1834 and the Armagh Observatory in 1790. The Observatory was part of Archbishop Robinson's plan to have a university in the city. This ambition was finally fulfilled, albeit briefly, in the 1990s when Queen's University of Belfast opened an outreach centre in the former hospital building. Three brothers from Armagh died at the Battle of the Somme during World War I. None of the three has a known grave and all are commemorated on the Thiepval Memorial to the Missing of the Somme. A fourth brother was wounded in the same attack. On 14 January 1921, during the Irish War of Independence, a Royal Irish Constabulary (RIC) sergeant was assassinated by the Irish Republican Army (IRA) in Armagh. He was attacked with a grenade as he walked along Market Street and later died of his wounds. On 4 September 1921, republican leaders Michael Collins and Eoin O'Duffy addressed a large meeting in Armagh, which was attended by up to 10,000 people. During the Troubles in Armagh, the violence was substantial enough for the city to be referred to by some as "Murder Mile". Over the span of 20 years, 24 individuals were killed in 13 different incidents. In the 2011 Census Armagh had a population of 14,749 people (5871 households). 1.0% were from an ethnic group other than white. Armagh, like most of Ireland, has a temperate maritime climate (Cfb) according to the Köppen climate classification system. The nearest Met Office standard weather station, at Armagh Observatory, provides long term weather data back to 1844. During that time, the highest temperature to be recorded was 30.3 °C (86.5 °F) on 10 July 1934. The lowest temperature was −15.1 °C (4.8 °F) on 7 February 1895. Typically, the warmest day of the year will reach 26.1 °C (79.0 °F), and 3.7 days a year should attain a maximum temperature of 25.1 °C (77.2 °F) or above. Typically the coldest night of the year should fall to −6.8 °C (19.8 °F) and 40.4 nights should register an air frost. All averages refer to the 1981–2010 observation period. Armagh is the site of two cathedrals, both on hills and both named after Saint Patrick. The Church of Ireland cathedral dates back to around 445. The present-day, post-Reformation, Roman Catholic cathedral was constructed during the latter half of the 19th century and features twin 64m spires, making it the tallest such structure in the county. 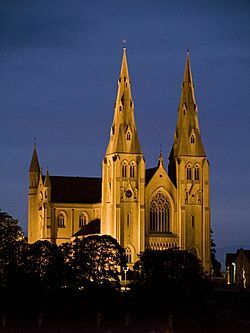 Armagh is one of the few cities in the world which is home to two cathedrals of the same name. Armagh has a Georgian area of heritage importance. Perhaps one of the more well known of the buildings is the former women's prison. The construction of Armagh Gaol began in 1780 and was extended in the 1840s and 1850s. The front façade of the prison was built in the Georgian style, while the later development, based on the design of Pentonville (HM Prison), is Victorian. For most of its working life it was a women's prison although not exclusively so. Armagh Gaol was the primary women's prison in Northern Ireland. In 1986 the prison closed and its prisoners were transferred to the new prison at Maghaberry. The city is home to the Armagh Observatory, founded in 1790, and to the Armagh Planetarium, established in 1968 to complement the research work of the Observatory. The palace of the Archbishop of Armagh is now the local council offices and, along with the archbishop's private chapel, is open to the public. The Palace Stables heritage centre is a reconstructed stable block dating from the 18th century, which was once part of the Archbishop's estate. Among the city's chief glories is Armagh Public Library on Abbey Street. It was founded in 1771 by Archbishop Richard Robinson (later Lord Rokeby), using his own library as its nucleus. It is especially rich in 17th- and 18th-century books in English, including Dean Jonathan Swift's own copy of the first edition of his Gulliver's Travels with his manuscript corrections. Armagh Market House was built in 1815 as a two-storey five-bay building, and is currently used as a library. Armagh County Museum is the oldest county museum in Ireland. The building dates from 1833 and was originally a school house. It was opened as the County Museum in 1937. 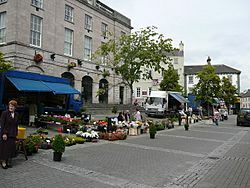 To combat the problem of a diminishing city centre and to address the concerns of local people, Armagh City and District Council decided to upgrade the surfaces and general appearance of the main shopping areas. The scheme aims to deal with the many issues raised by the public and businesses over recent years. It will regenerate the centre of Armagh, transforming it into a high-quality pedestrian-friendly environment. The ineffective pedestrian area in Market Street will be opened officially to vehicles. The scheme will provide wider footpaths, pedestrian crossings and disabled parking throughout the city centre to improve safety and accessibility. As well as these new street layouts the appearance of the city centre will be enhanced by new lighting, paving, seating, bins and greenery. The use of quality stone materials, public art projects and feature lighting will contribute to the overall effect and present the city's famous architecture at its best. A shop frontage scheme will be launched toward the end of the street development project. The scheme includes eleven streets: Market Street, Thomas Street, Ogle Street, Scotch Street, Dobbin Street, Dobbin Street Lane, Barrack Street, McCrum's Court, Upper English Street, Russell Street, Ogle Street and Linenhall Street. The £5m Armagh City Centre Regeneration Scheme is funded by Armagh City and District Council, the Department for Social Development, Transport NI and the Arts Council of Northern Ireland. The Ulster Railway linked Armagh with Belfast in 1848 and Monaghan in 1858. The Newry and Armagh Railway (N&A) opened in 1864 and the Castleblayney, Keady and Armagh Railway (CK&A) was completed in 1910. In 1876 the Ulster Railway became part of the new Great Northern Railway (GNR), which took over the N&A in 1879 and the CKA in 1911. The Armagh rail disaster, which killed 80 people, occurred on 12 June 1889 on the N&A line near Armagh. The partition of Ireland in 1922 hastened the railways' decline, and the GNR closed the Keady – Castleblayney section of the CKA in 1923. The GNR withdrew passenger trains from the Armagh – Keady section of the CKA in 1922 and closed the Armagh – Markethill section of the N&A in 1933. The Government of Northern Ireland forced the GNR Board to close all remaining lines serving Armagh railway station on 1 October 1957: the goods branch from Armagh to Keady and the main line through Armagh from Portadown as far as the border at Glaslough on the way to Monaghan. Northern Ireland Railways train services run from Portadown to Belfast Great Victoria Street and the cross-border Enterprise service runs via Newry to Dublin Connolly. Poyntzpass also has a limited service. Government Minister for the Department for Regional Development, Danny Kennedy MLA has indicated plans to restore the railway from Armagh station to Portadown. Armagh is within the civil parish of Armagh. Like the rest of Ireland, this parish has long been divided into townlands, whose names mostly come from the Irish language. Over time, more townlands have been built upon and they have lent their names to many streets, roads and housing estates. In 1830, most of Armagh's urban townlands were amalgamated (for administration) and became known as Corporation Lands or simply Corporation. However, the surrounding townlands remained as separate units and they were eventually built upon too. They are listed below alongside their likely etymologies. AI715.2 Flann.Febla, abbot of Ard Macha, rested. AI729.1 Kl. Repose of Suibne, abbot of Ard Macha. AI750.1 Kl. Repose of Congus, abbot of Ard Macha. AI768.3 Repose of Feradach son of Suibne, abbot of Ard Macha. AI772.2 Suibne, abbot of Ard Macha, [rested]. AI791.1 Kl. Cú Dínisc son of Cú Ásaig, abbot of Ard Macha, rested. AI793.1 Dub dá Leithe, abbot of Ard Macha, rested. AI794.1 Kl. Airechtach, abbot of Ard Macha, [rested]. AI795.3 Repose of Faendledach Bec, abbot of Ard Macha. AI807.1 Kl. Connmach son of Dub dá Leithe, abbot of Ard Macha, rested. AI808.1 Kl. Taicthech grandson of Tigernán, lector of Ard Macha, rested. AI834.1 Kl. Eógan, bishop of Ard Macha, rested. AI845.2 Forannán, abbot of Ard Macha, was carried off by the heathens from Cluain Comarda, and the shrine of Pátraic was broken and carried off by them. AI846.1 Kl. Niall son of Aed, king of Temuir, was drowned in the Calann, i.e. a river beside Ard Macha. AI852.2 Forannan and Diarmait, abbots of Ard Macha, fell asleep. AI852.2 Repose of Cathasach, abbot of Ard Macha. AI874.1 Kl. The third feria [Tuesday], ninth of the moon. Féthgna, abbot of Ard Macha, rested in Christ. AI883.2 Repose of Cathasach, abbot of Ard Macha. AI888.3 Repose of Mael Coba son of Crunnmael, abbot of Ard Macha. AI893.1 First after Bissextile. Kl. Repose of Mochta, bishop of Ard Macha. AI924.2 Muiredach son of Domnall, abbot of Mainister Búiti and tanist-abbot of Ard Macha, rested. AI927.1 Kl. Repose of Mael Brigte son of Tornán, abbot of Ard Macha and abbot of Í Coluim Chille. AI936.1 Kl. Repose of Ioseph, abbot of Ard Macha; and Mael Pátraic succeeded him in the abbacy. AI966.2 Repose of Muiredach son of Fergus, abbot of Ard Macha. AI973.3 Dub dá Leithe, coarb of Patrick, came to Mumu and made his visitation; and he and the coarb of Ailbe quarrelled regarding the levy, and Mathgamain, king of Mumu, made peace between them, and they agreed upon the perpetual right of [the coarb of] Patrick. AI996.4 Ard Macha was set on fire by lightning, which did not leave unburnt a steeple therein, nor a house, nor the house of an elder inside the fort. AI996.5 Dub dá Leithe, coarb of Ard Macha (or, of Patrick) and coarb of Colum Cille, rested in Christ. AI1001.2 Muirecán, abbot of Ard Macha, was expelled from his abbot's seat, and Mael Maire took the abbacy instead. AI1005.5 Repose of Eochaid ua Flannacáin, historian of Ard Macha. AI1020.3 Mael Muire son of Eochaid, coarb of Patrick, rested in Christ. AI1020.4 Ard Macha was burned, both stone-church and bellhouse, and all the buildings. AI1026.3 The coarb of Patrick, accompanied by his venerable clerics, and Donnchadh son of Gilla Pátraic, king of Osraige, [were] in the house of Donnchad, son of Brian, at Cenn Corad at Eastertide. AI1029.8 Flaithbertach Ua Néill, on his pilgrimage to Ard Macha. Armagh's Mall is home to the Armagh Cricket Club, and has also staged international matches. Armagh Facts for Kids. Kiddle Encyclopedia.